Johannesburg – The 29th Africa Cup of Nations soccer games will commence on Saturday, January 19th at the National Stadium in Johannesburg with South Africa’s team, Bafana Bafana, playing against Cape Verde. The host team received a visit from President Jacob Zuma today. “Zuma took time off his busy schedule to give a word of encouragement to the national team as they go into battle with some of the best on the continent,” the South African Football Association (SAFA) said in a statement. The South African President dribbled a ball and held a private meeting with the players while also facing the media to address critics who say his country is not well-prepared for the continental gathering. 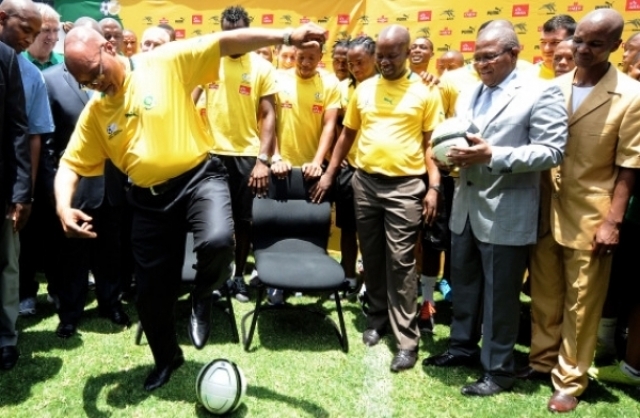 Zuma displayed his soccer skills before he was given two Bafana Bafana jerseys by team captain Bongani Khumalo.